If you want to retire in a place that is chock-full of natural beauty, world-famous cultural events and great healthcare, you’ll love Massachusetts. The Bay State has lots of smaller beach towns to the east, and if you prefer living by the mountains, the commute isn’t that long either – only 3 hours of driving from any place in the state. The area between the water and mountains is filled with fertile farmland meaning there’s a bit of this and that for everyone. If you’re considering Massachusetts for retirement, you should get informed about the senior living costs, facilities, and benefits that await you once you get there. Here, on Assisted Living Facilities, you can find out more about the senior living options in Massachusetts, be it independent living facilities or assisted care. You’ll also find information regarding the various support systems that have been put in place by these facilities, including the amenities that they have to offer their residents. In the list below, you will find all the cities that have senior living facilities in the state, so feel free to use it and find the facilities that are close to the city of your choosing. When compared to the national average, Massachusetts’ housing index of 137.70, makes it an expensive state to retire to. One-bedroom apartments have an average monthly cost of $1,067, compared to the national average of $825. Two-bedroom apartments go for an average price of $1,335 per month, compared to the national average of $1,027. Massachusetts also has adult daycare facilities that provide seniors with daily supervision while their primary caregiver is dealing with his/her own daily chores and obligations. Adult daycare facilities in Massachusetts have an average monthly cost of $1,408. It is important to point out that adult daycare doesn’t have ‘round the clock extensive care, meaning it’s best suited for seniors that are still mostly active and healthy, but still in need of social activities. Assisted living facilities in Massachusetts operate to provide assistance to seniors that have trouble completing their daily tasks without any help. Residents of these facilities are provided with housing, as well as access t personal care and health services for the average monthly cost of $5,599. Nursing homes in Massachusetts provide 24/7 care and supervision for seniors whose primary caregivers are not able to provide for them. Nursing homecare in Massachusetts is rather expensive, and semi-private rooms have an average monthly cost of $11,710, while seniors that want more privacy can opt for a private room for the average monthly cost of $12,471. The costs for nursing homes in Massachusetts are high, but seniors’ relatives will be at peace of mind, knowing that their elder is being cared for in a specially designed environment with access to medications, supervision, ‘round the clock nursing care, as well as therapies and rehabilitation at one of the nursing home facilities. Even though Massachusetts is one of the smaller states in the nation, it has lots to offer its residents. The Old Colony State has a rich history, delicious food, and many little adorable towns. If this is not enough to convince you to retire in Massachusetts, keep reading. The thick forests and hills in Massachusetts provide their visitors with some of the most beautiful scenery the nation has to offer. Fall is characterized with the beautiful colors of falling leaves, and winter covers the trees and 19th century buildings. With a climate as distinct as this, the seasonal changes throughout the year are beautiful enough to mesmerize any visitor. Massachusetts is a state that ahs been mentioned in many history books all over the globe. Starting from the pilgrims landing at Plymouth Rock, then to the Salem Witch Trials, and the Boston Tea Party which gave way to the Revolutionary War, seniors that live or retire in Massachusetts will have plenty of written and unwritten history to study and see. There are historical societies all over the state, and they are involved with the community of every town they are located in. These historical societies often have events that provide an in-depth exploration into various historical time periods. As we get older with each day, great healthcare gets more and more important. Seniors residing in Massachusetts will have access to this state’s high-end hospitals, as well as universal healthcare that has been put in place back in 2006. Another interesting fact about this state’s healthcare is that it became a model for veterans’ healthcare. To wrap it up, if you ever get sick, there aren’t many places you’d rather be than in Massachusetts. Seniors residing in Massachusetts have many senior living options to pick and choose from, and they include independent living, assisted living, memory care, and nursing homecare, depending on the senior’s needs and wants. Each of these options is further explained down below, so keep on reading in order to find out more about them. With over 280 independent living facilities to choose from in Massachusetts, seniors will have no trouble finding the one that is right for them. Independent living facilities are best suited for seniors that are still mostly active and healthy, and not in need of ‘round the clock nursing care. Seniors that prefer apartment style living can choose to live among their peers in one of the active senior communities for seniors aged 55+ or 65+. These apartment communities have various amenities to offer their residents, including gyms, walking trails, pools and jacuzzies, and much more. Depending on the location and level of care needed, the average costs for independent living facilities in Massachusetts can range anywhere from $694 to $4,187. The more affordable facilities can be found in the Worcester area, while the most expensive independent living facilities are located in the Boston-Cambridge-Newton areas. Seniors that need a higher level of healthcare and professional caregivers should take a look at some of the assisted living facilities in Massachusetts, which also offer many social and local activities for seniors to take part in. Residents of these facilities will receive help with housekeeping, laundry services, transport, meal preparation, and ‘round the clock surveillance for their safety. These facilities have an average monthly cost range from as low as $1,263 to as high as $7,613. The costs for assisted living facilities vary greatly, depending on the location they’re at or the level of care needed. The most expensive ones can be found in the Boston-Cambridge-Newton metropolitan areas, while the more affordable ones are located in the rural areas. Seniors struggling with Alzheimer’s, dementia, or dementia-related illnesses can find solace at one of the 350 memory care centers that can be found all over Massachusetts. These centers have professionally trained staff that provides assistance to seniors with memory loss, as well as help with daily tasks, meal preparation, and medical attention will be provided by an on-site physician. 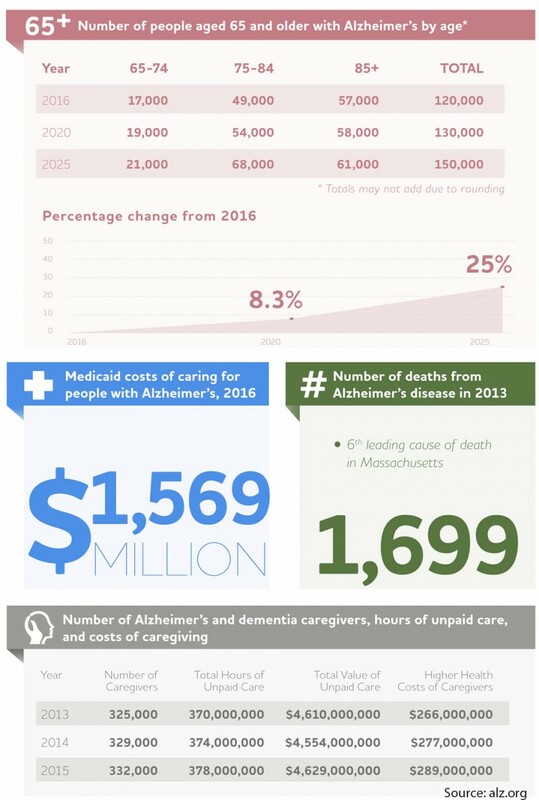 The average annual cost of memory care centers in Massachusetts is $91,297. The size of the state might be small, but it’s filled with almost 1,000 senior living providers that can satisfy every health and mental need seniors might have, as well as assistance with day-to-day tasks, and meal preparation, to name a few. Adult daycare facilities have 24/7 staff on hand, providing help to seniors with their medication, personal care, daily walks, and more. The average annual cost of adult daycare facilities in Massachusetts is $16,900, with monthly costs ranging anywhere from as low as $1,200 to as high as $2,850. Massachusetts is home to 83 of these facilities, meaning seniors should be able to find one that best suits their needs. Seniors that have been diagnosed with a terminal illness can seek help at one of the 103 hospices scattered all over the state. This type of senior care allows seniors to live out their remaining days as peacefully and as comfortable as possible. This is done with the help of medications and various types of therapies so as to minimize the physical pain brought upon by their illness, including on-site physicians that monitor the residents’ health. Hospices also provide chaplain services for spiritual support, if needed. There are also many respite care facilities that can be found in Massachusetts, providing temporary care for seniors whose families are either unable to provide the level of care necessary or too busy with their own duties and responsibilities during the day. Respite care can be used in many ways, be it interval care where a certified caregiver visits the senior at their own home for a set amount oh hours during the day, week, month, or indefinitely. The average annual costs for respite care in Massachusetts are $126,290, but this can vary depending on the location of the facility or the level of care needed. HospiceCare in the Berkshires, Inc.
Assisted-living-facilities.net will help you to find the best quality Assisted Living facilities in Massachusetts. You can also find skilled nursing, memory care facilities, retirement communities and assisted living regulations in Massachusetts. Here you can compare ratings and check prices and costs for assisted living. Read reviews and more, with the best directory for Assisted Living Facilities. The state of Massachusetts has 1160 assisted living facilities. If you're searching for information about assisted living communities in Massachusetts, you need to look no further! Assisted-living-facilities.net will provide you with the most comprehensive information about the number of 1160 assisted living facilities for seniors that are currently available in Massachusetts. The assisted living services available in Massachusetts include in-home residential and assisted living situations, nursing homes, retirement communities, adult day care, and a range of independent living situations, you can also find Alzheimer's and hospice care. Searching in Assisted-living-facilities.net to find information about Massachusetts's assisted living communities is simple! You can use the site in these ways to search and find the assisted living facility or community that is the right one for your needs, and allows you or to your loved one, to live close to friends and family and to enjoy fully. Getting all the support of the amenities that Massachusetts has to offer. The average monthly starting costs for assisted living facilities in Massachusetts (higher for residents requiring memory care) starts and depends on the level of care the resident. The average monthly cost of assisted living in Massachusetts starts from $1,700 to $5,000.